Susan McConnell and partner Beth O'Neil live and work on the North Side of Chicago. As a young lesbian Beth was encouraged by mentors in the Chicago Women's Liberation Union ( CWLU ) to explore her lesbianism in the early 1970s. Beth was among a group of lesbians that went on to found WICCA, a women's crisis hotline. There she met Susan her partner of the last 25 years. In the mid 1970s, Beth and several other women birthed the women-only space Mountain Moving Coffeehouse. 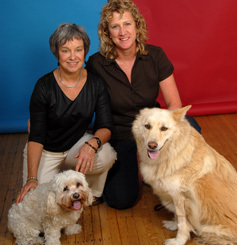 In 1979, Beth and Susan were hired as the original counseling staff of the first domestic violence shelter in Chicago. Both have worked as professionals and volunteers in HIV and AIDS and lesbian-focused groups. They both have private practices doing individual and couples therapy in addition to leading trainings, workshops and retreats. They enjoy playing with their dogs at their Indiana dunes home, savoring visits with daughter Sarah, and look forward to being queer grandmothers. They are blessed with dear friends and wonderful family.